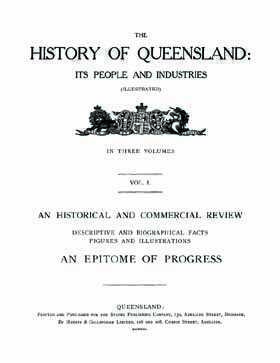 Fox’s History of Queensland, is similar to the Cyclopedias that were published for most states of Australia around the beginning of the 20th Century. Cyclopedias are a vast resource of historical and biographical information on the state concerned - the people, towns, industries, professional, commercial and social institutions and much more. Fox’s History of Queensland, is the largest of these publications and is very rare; an original set can cost as much as $3000. This comprehensive Queensland resource includes information ranging from flora and fauna to industry, from geology and history to politics as well as information relevant to the day on schools, hospitals, infrastructure and farming. It includes a large section on the major towns, regions and homesteads throughout Queensland, as well as a large number of biographies on influential and ordinary citizens throughout the community. The three volumes have thousands of illustrations scattered throughout, a large number of these being photos of people as well as places, buildings, and scenes from the past.